Spring mint shoots up in lush abundance. Early rains keep it coming. Its determined taproot spreads faster than weeds and will take over a garden plot in a season. Even with ruthless cutting and uprooting, mint marches on. It’s fragrant, bright green, and delicious. I keep picking it, trying to use a handful in dinner every evening. As a spring tonic it’s healthy; it aids digestion, calms nerves, and clears a winter cough. So before ripping mint out of your flowerbeds, keep some—and enjoy! The wild plant I’m referring to here is plain spearmint. This is true mint, not to be confused with peppermint, pineapple mint, or chocolate mint. These varieties all have a place, but they seldom work in savory foods the way spearmint does. Spearmint is popular in peasant foods all over the world and is especially at home in India, the Levant, and North Africa. Mint stars in salads, fresh chutneys, raitas, stews, and teas. I enjoy having a jar of mint pesto on hand to toss with the fresh asparagus we’ve been getting from our local farmers’ market. Pesto doesn’t always have to be basil, pine nuts, and cheese. After all, it’s basically pounded—think pestle—herbs, and it tastes freshest when it’s crushed in a marble or stone mortar away from the heat-producing motor of a blender or processor. This simple pesto of fresh mint leaves, garlic, salt, and olive oil will dress any lightly cooked vegetable, enliven steamed potatoes, or glaze a grilled fish fillet. Use a sharp knife to cut mint leaves into fine chiffonade. (Cup a bunch of leaves in one hand and swiftly chop through them, continually retracting your fingers.) Slice peeled garlic. Pound sliced garlic with salt using a mortar and pestle. Add the shredded mint a handful at a time crushing it to a rough paste. Continue until all the mint is pulverized. Work in the olive oil a tablespoon at a time. Store in a glass jar in fridge until ready to use. Makes ¼ cup fresh mint pesto. Use to flavor vegetables along with a little of the cooking water. 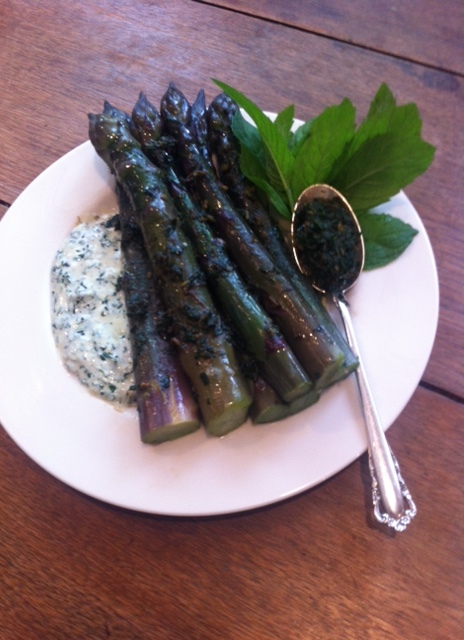 Stir a teaspoon into vinaigrette dressing or mix into plain yogurt for a mint dipping sauce. In the back room of Home Style Bakery where icing was whipped in deep bowls, tinted pastel shades and piped into scrolls, roses, and lacy letters, birthday cake spelled delight. Even as a young girl, I knew if I wanted one of these cakes, I’d better learn to make it myself. So began a life-long love of birthday baking. I copied the masters, practiced on cardboard with Crisco until the pastry bag became an extension of my hand. My children had cakes of billowing doll dresses, trains, flower gardens, and trees. With the passage of time we all found the baked portions more interesting than the icing. 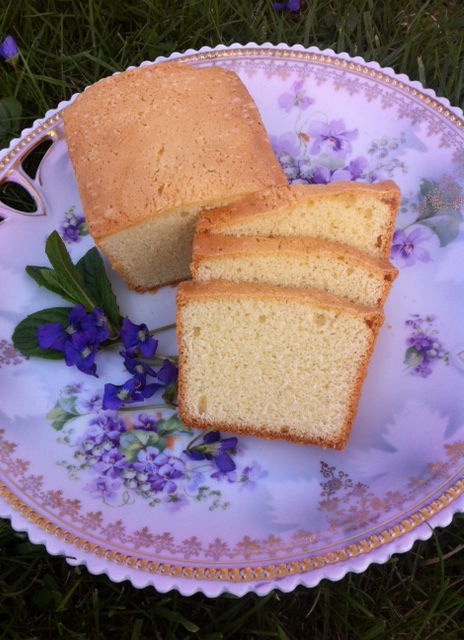 My daughter opted for pound cake, my son for Swiss butter cream–filled sponge, and I found mine in a dense volume from the legendary Paul Bocuse. I had once pored over Bocuse’s book, though I no longer own it nor remember his exact title. Yet I still have the remnant of his Pain de Gênes penciled in a recipe notebook. Each May I leaf through its pages to find this special cake and use the remainder of almond paste saved from my Christmas stollen. Perfect in its simplicity, this delicate item wants no icing and will take you back in time as you savor its sweetness with a cup of strong coffee or a pot of tea. This cake is not a quick mix, chemically leavened layer, but a long-beaten, carefully folded, naturally rising confection. It may test patience, but once mastered, it’s a gem. Measuring is crucial, and although I’ve listed cup alternatives, there’s no substitute for an accurate scale. Have all ingredients at room temperature. Butter and flour 1 7-inch deep round cake tin or 2 small loaf pans (6 x 3 ½ inches). Preheat oven to 350°. Crumble almond paste in the bottom of mixing bowl for stand mixer. Add extracts, salt and optional anise. Attach paddle beater. Using moderate speed, add eggs one at a time, beating several minutes after each addition until the mixture looks like a thick even cream. Alternate three ounces of sugar after adding each egg. The egg, almond paste, sugar mixture should be beaten until it is light and thick enough to form a figure 8 when the beater is lifted from the mass. This process will take at least 10-12 minutes of continuous beating. Meanwhile sift the flour and the remaining half-ounce of sugar three times, and make sure the butter is melted and cooled to lukewarm. When the egg mass tests ready, remove from stand mixer, clean off paddle and fold the sifted flour/sugar in three additions using a rubber spatula. Fold the melted, clear butter into the batter thoroughly in three additions. Turn the cake into the prepared tins, smoothing the top. Place in the preheated oven and reduce the oven temperature to 325°. Bake for 30-35 minutes or until tests done. Allow cake to rest in the baking tin for 5 minutes before removing to a wire rack to cool. Makes 1 round layer or two small loaves. Store in an airtight tin to enjoy for a week. You are currently browsing the Mary Jo's Kitchen blog archives for May, 2014.